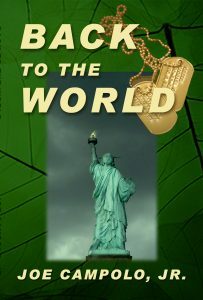 Back To The World is the sequel to The Kansas NCO, and also an award winning novel. The Kansas NCO is a story about a group of men who survive a plot to kill them by the head of a black market operation during the Vietnam War. The men, who barely escaped with their lives, come back to a hostile, unwelcoming nation. Bitter about the fate of their dead comrades in Vietnam, and the treatment they receive back home, the men take out their anger on the same people who targeted them for death in Vietnam; criminal drug gangs. The bold men strike out at the large criminal empire of Southern California, taking on the Italian Mafia, as well as the ever growing Mexican Mafia, who are gradually replacing the Italian Mafia as the most powerful criminal gang in Southern California. As in Vietnam, the men find themselves targeted for death by criminals as well as those entrusted with fighting criminals. As the men scramble to avoid termination, they find unique allies and unique enemies as well. Back To The World is a fast paced page burner! Back to the World is a well crafted follow-up to The Kansas NCO. Joe Campolo allows the reader to experience the frustrations of returning Vietnam veterans whose country abandoned them. Joe is able to take you from the jungles of Nam to the mean streets of America. God bless all our veterans. Joe Campolo has hit another home run with Back to the World! This fast-paced thriller keeps you on the edge of your seat as it follows the trail of two vigilantes challenging the Mob.